Lee Elias has made a career out of proving he was right. From books that support his results-driven team-building strategies to his burgeoning business ventures, Elias wants you to know he can back up his plays with some powerful business moves. Empowered by his passion for sports and ready to get his career in hockey started, Elias enrolled in Montclair State University to study broadcasting because to him, it seemed like the way to get into sports if he wasn’t going to be playing. Staying true to his mission and never wavering in his resolve, Elias landed a job at the National Hockey League headquarters directing “NHL Live” and helping to manage the launch of NHL Network USA. With such an impactful position at the beginning of his career, Elias continued to find ways to fuse his passion for sports with his directing and editing talents by working at NBC Sports and The Madison Square Garden Company after leaving the league. Elias’ career took a step back when his wife’s service in the Air Force and medical school studies led her to Fort Walton Beach, Fla. Without a connection to the minor leagues in his new neighborhood and unable to find a job in his field, Elias decided it was the perfect time to return to school and further his education. When his wife’s career took them to a new location in England, Elias knew the flexibility of the online program would allow him to stay with his family and still get his degree. Elias took the move as an opportunity to get a fresh start and found one in the Peterborough Phantoms, working as a marketing manager. “Everything I had done at Drexel I was pouring into this team,” says Elias. “I applied everything from my master’s thesis to that team and [it] saw a shift from one of the worst teams in both a team and marketing aspect to one of the top teams in the league.” Elias did so well as marketing manager that the following year he worked as assistant coach – taking the team to a playoff championship that same year. Coming off the success of the Peterborough Phantoms and ready to return home, Elias took the success of the team and found an unlikely new career path: writing. With the direction and encouragement of his professors, Elias wrote, “Think Like a Fan: Invest in Your Fans So They Invest in You,” using his master’s thesis as the foundation for the work. The company became profitable within six months and is currently distributed in over 100 stores across the country. But what’s most important for Elias is the impact he’s been able to make on his community and in the business realm. “I’ve been able to create jobs and everything is made in America and that’s all very important to me,” he says. Through his network and proven strategies in hockey and business, Elias has also been able to start a third company, WeLive.Hockey. The company is a network of hockey content creators, influencers, and players that engages with fans and companies alike. With such an obvious success in business and a growing list of authored work, you would think Elias would have enough on his plate; but for him, there’s always more he can do. Working on his third book and consulting with other businesses, Elias has also taken up another endeavor: teaching. 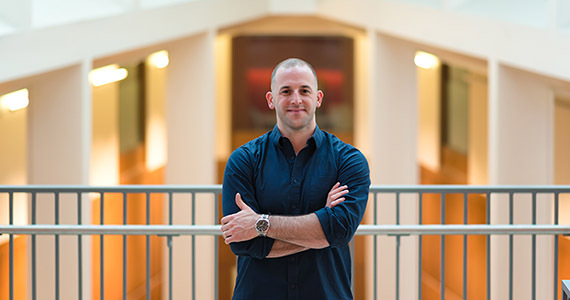 Elias serves as an adjunct professor in the sport management undergraduate program and says it may be one of the most rewarding aspects of his already busy schedule. “It’s funny to be on the other end of it. I’m asking my students to talk about sports with me and the most enjoyable part is seeing them learn,” says Elias.